Half my time at Lionsrock has gone already and it has gone by quickly. I really enjoy my time here. Day after day is passing quickly with doing always a morning tour along half of the enclosures here to see all of the big cats. When you are here for a few weeks and visit the same animals each day for approximately half an hour, you get quite attached to them. After a while you are able to make out the different characteristics and also see differences in the animals. With some of them I had the feeling that they liked me visiting them, talking, playing music from the mobile phone and observing them. After the visits it is already time for lunch, where we have a good hour to prepare something in the well equipped kitchen. After lunchbreak there are different things to do each day. Monday is preparing enrichment for servals and caracals and bringing it into the enclosures. Additionally we get involved with the feeding of the big cats along with the animal keepers. On Tuesday we have to cut bushes along the fences, where the animal keepers cannot reach it with heavy equipment. Wednesday is our volunteer shopping afternoon, but we mostly have only a little bit over one hour, which is quite short for doing the errands for a whole week.- a bit of a challenge and you can’t get herbal tea here! Thursday is preparing enrichment for one of the units and driving there with the animal keepers to throw it over the fences. On Fridays we cut bushes again and also type in all the data from the previous day with enrichment. Enrichment day is also a favorite day to make pictures because the animals mostly love the toys we volunteers prepare for them. It is so much fun to watch them pacing the fance eager for what we are throwing over it: cartons with hay and spices or papiermachee balls filled with hay and spices, eggs, or a frozen mixture of water and animal blood with a cowtail sticking to it. This is quickly a whole week is done. In your freetime you can walk up the Lionsrock to get a nice view overthe landscape or go by bike to a platform, where you have the best view on top of the enclosures. You meet a lot of friendly people here and eating at the lodge is nice and not too expensive. 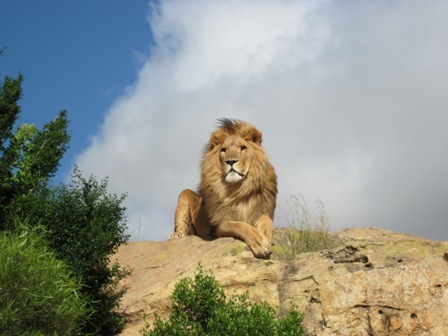 To find out more about volunteering at LIONSROCK, visit our lion conservation page.